You can virtually join two robots exploring the deep sea off British Columbia during a three-week mission to discover new species, map the ocean floor, upgrade high-tech undersea sensors – and drop off a couple of fresh pig carcasses. Join two robots exploring the deeps off the British Columbia coast — without getting wet. You can watch them online during a three-week mission by the University of Victoria's Ocean Networks Canada in the Salish Sea and Pacific Ocean to discover new species, map the ocean floor, upgrade high-tech undersea sensors – and drop off a couple of fresh pig carcasses. The remotely operated vehicles (ROVs) Hercules and Jason will be livestreaming their views as they visit eight underwater observatories operated off the B.C. coast. The remotely operated vehicles (ROVs) Hercules and Jason will be livestreaming their views as they visit eight underwater observatories operated by the University of Victoria's Ocean Networks Canada in the Salish Sea and Pacific Ocean off the B.C. coast. (Ocean Networks Canada) Those who join them for this year's edition of the annual mission, which was launched Tuesday, will visit rarely seen marine environments up to 300 kilometres offshore and three kilometres below the surface. 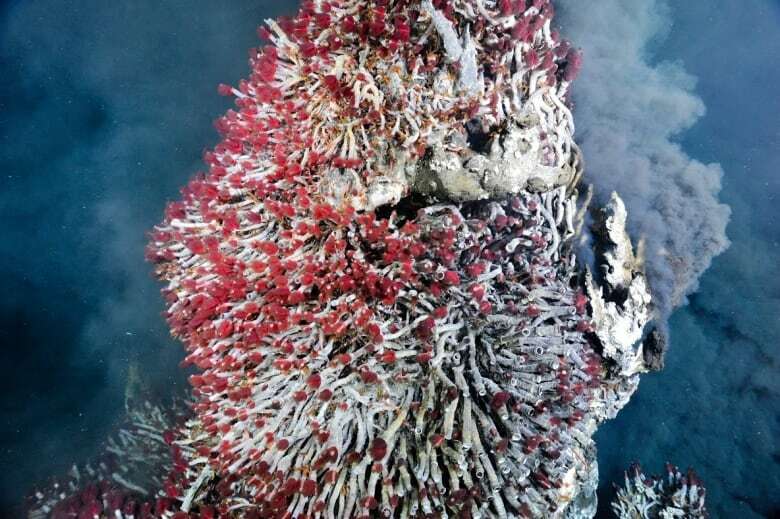 The sights will range from black smokers – giant, multi-storey chimneys spewing black, mineral-rich, super-heated seawater – and areas where gas bubbles out of the sea floor, to a huge variety of ocean life, Kate Moran, president of Ocean Networks Canada, told CBC News. "They might see whales, they might see skates. 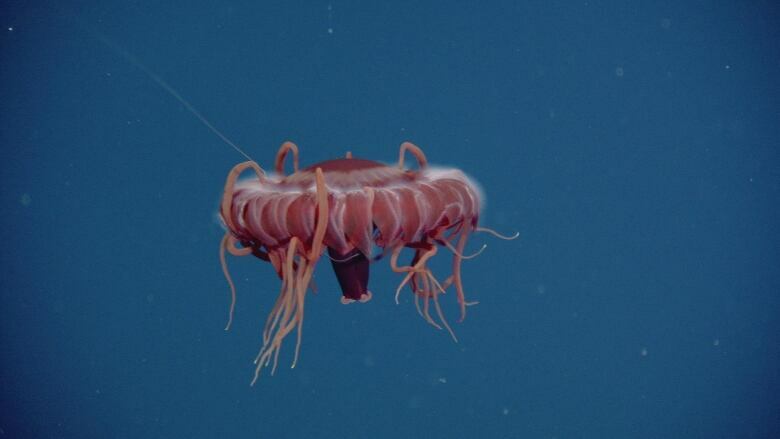 They'll see lots of jellyfish — they're always guaranteed," Moran said with a laugh in a phone interview from one of the mission's research ships. Common fish in the region include ratfish, hagfish, cod and black cod, and there are also lots of invertebrates such as sea pens, animals that resemble elaborate, colourful plumes, Moran said. Many of the species in the deep sea haven't yet been identified, so the robots will be shooting video of them, as well as collecting specimens and bringing them back to the surface. Tough ones, such as shellfish, will be grabbed by the robots' manipulator arms, while more delicate ones will be sucked into special tubes. The mission will run 24 hours a day, although there will be times, such as when the subs travel at high speed between sites aboard the research ships Nautilus and Thompson, when online viewers won't see much. 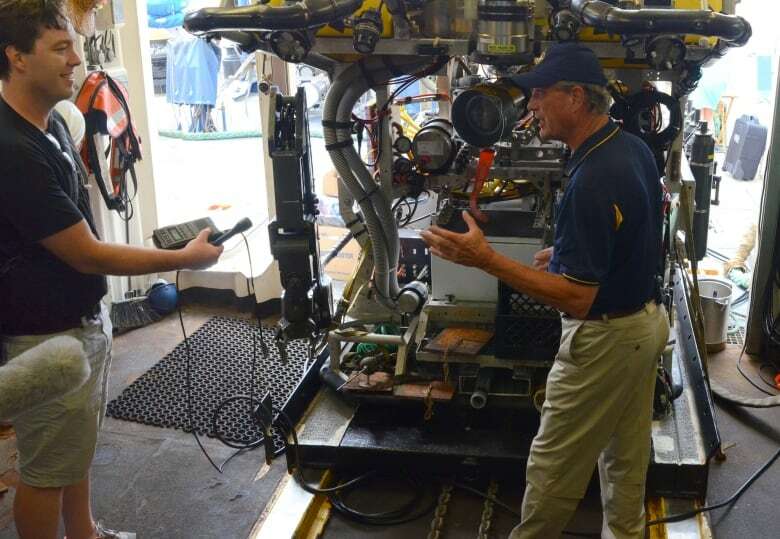 The Nautilus, operated by the U.S.-based Ocean Exploration Trust, is joining the mission for the first time. The organization is headed by Robert Ballard, who discovered the wreck of the Titanic. View the ocean as you descend from the surface to the ocean floor. See the entire landscape around the observatories. Watch science and technology in action. A multi-lens camera that will shoot 3D images in Saanich Inlet, on Vancouver Island. 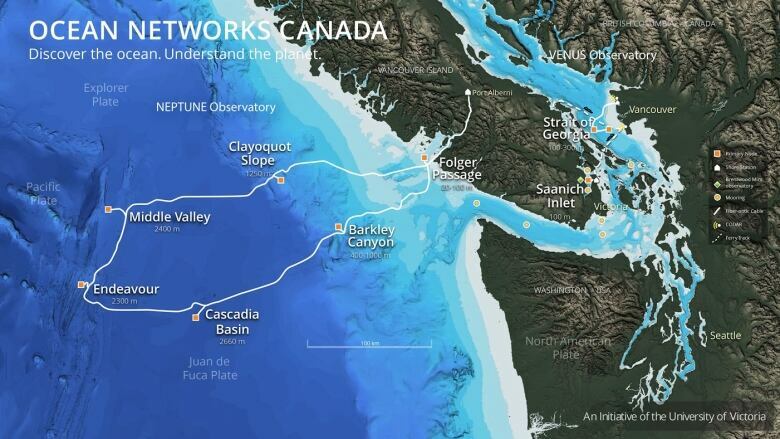 New sensors to measure underwater landslides in the Fraser Delta. Microphones to detect whales and measure the noise from passing ships. New tsunami detectors at Cascadia Basin. Temporary sensors that aren't connected to the network will be dropped off at the Barkley observatory, where a trawler had earlier severed the internet and power connection. A replacement box to restore internet and power will be added later. The robots will also do some undersea mapping and drop off two fresh pig carcasses in the Georgia Strait for forensic research. The goal is to reveal how bodies decompose underwater – research that could be useful to police investigators when a body is pulled from the ocean.